Since November 2010 I’ve had an idea brewing in my head. Often obsessing and sometimes losing sleep over it, this summer I finally got my act together and pitched it to Unltd (a fund for social entrepreneurs) for some start-up cash but mostly for something to kick me into action. So (drumroll please) this is where I officially announce the beginning of Just Another Football Club. Yes, it’s exactly what the world needs. Another football club. The idea is to create a community football club for girls between the ages of 13-17. The issue I’m trying to tackle is retaining girls in the game, as there is a really high drop off rate for girls in this bracket. And research has shown that this correlates with two things: a lack of funding for girls and women’s clubs and lack of support. I’ve always solicited my friends for money via bake sales, pub quizzes, football tournaments, half marathons, and more, to help support the football teams I’ve coached and played for. While I love events and my very generous friends, there has to be a better more sustainable way. The second issue, a lack of support, come from limited or no opportunities outside of actually playing the sport. 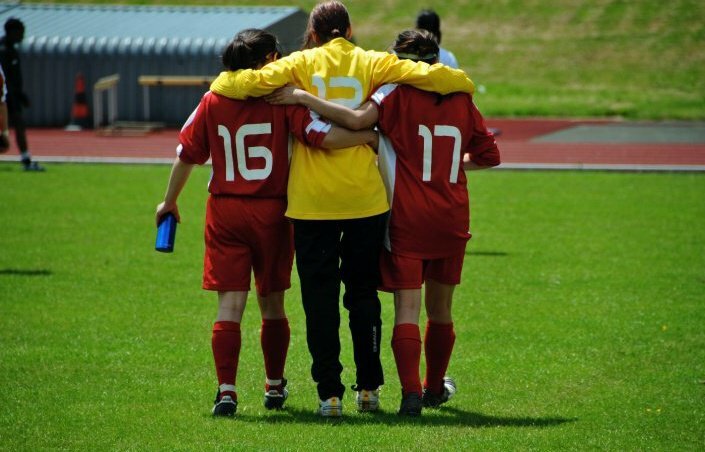 Sport has been known to increase self-esteem, develop leadership skills, build relationships and much more but what if a player loses interest in playing – can they still be a part of the team? The players will have opportunities to get involved in lots of different stuff – not just playing, but coaching refereeing, organising events and other activities. To tackle these issues and create the best football club ever*, my goal is to build a football club that would be owned and supported by the community. This won’t be an FC, it will be a CC. A community club. Anyone can become a member for a £10 share. All members are equal. This membership lets people to help make club decisions, receive special offers and discounts at local shops as well help fund a grass roots football movement. If you have ideas or skills to lend, know girls that want to get involved or just want to be one of the first members of the club, get in touch. The pilot starts tonight and will run every Tuesday night for 6 weeks at Petchey Academy in Hackney from 6-7pm. *solely my opinion, and likely mine alone.